While the exterior renovation continues, I am working on getting the interior details nailed down. One of those things is cushions for various pieces of furniture. Last year we bought a sofa. 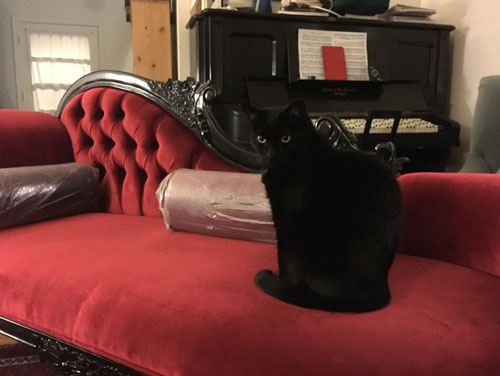 I can't seem to find anything posted about it, so I guess I just did it all subtle-like, but we bought this sofa, covered in a custom fabric that I sent them (because that's how I roll). It's a great sofa, but a little too deep to be comfortable, so I am in the process of covering it in cushions. They will also add a little more colour to the parlour, which always helps. Size Matters: What You Need to Know About Pillows -- a pretty decent primer on pillow sizes, and especially on how big pillows actually are and how they will look in 3D. 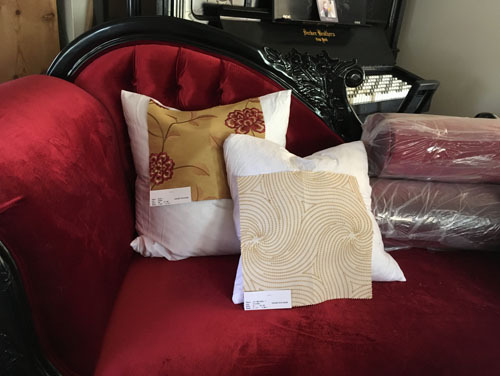 Takeaway quote: "Decorative pillow sizes are based on the size of the fabric that is cut to make the pillow." Size it Up: A Guide to Throw Pillow Sizes -- a bit about pillow sizes and how they related to your actual furniture. Takeaway quote: "Streamlined, modern furniture or tight, tailored pieces will look overwhelmed by oversized throw pillows." Throw Pillow Sizes -- more on the actual size of a pillow you might order online. 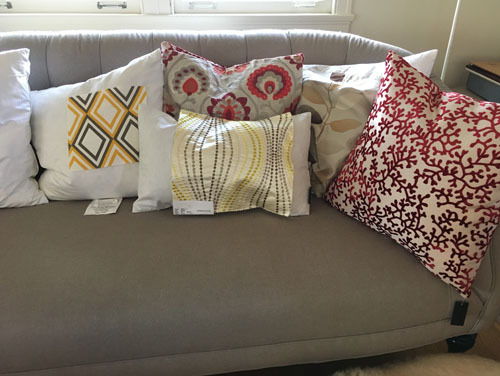 Takeaway quote: "The most important thing to remember is that pillow dimensions always refer to the pillow cover's width and length while lying flat unstuffed. The measurements are taken along the seams from corner to corner and are almost always rounded up to the nearest whole inch." OK, having read all that, I was ready to go. I wasn't crazy about the idea of spending hours of hunting through shops and online for the perfect pillows, so I decided to sew my own pillow covers. Now, I know this is not for everybody. And plenty of places will sew covers for you if that's what you want (you can ask at your local dry cleaner's if you need a place to start). But I have a lot of experience sewing (a few years ago I actually did half of an associates in fashion design at a community college, just to get better at commercial sewing technique), so it's not a big deal for me to sew cushion covers. 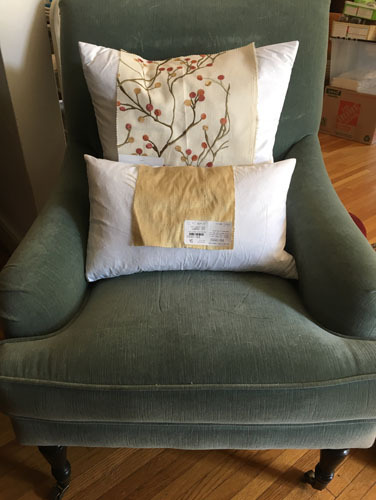 Sew Comfortable: How to Sew Perfectly Plump Throw Pillow Covers -- a nice little primer on making your own covers based on a pillow insert you already have. Includes a nice trick for making your covers look plump and full by softening the corners a little. How To Make A Zippered Pillow Cover (A Tutorial For The Total Beginner) -- the basics of making a zippered cover (I always make zippered covers, because of cat barf). Anyway, let's talk about my actual design decisions. Yes, we bought Dash a chaise longue. It's kind of taking up half our living room at the Admiralty right now, but eventually it will be in the library with the Janko piano (shown behind it in this photo). Some of these are available to the public without having a trade account, so I'll link you up. Left to right (back to front) they are: Premier Prints Annie Slub in yellow/kelp, Jane Churchill Orissa in linen/red, Fabricut Sabalo Jacquard in lemon, Fabricut Acamar in champagne, and Charleston Coral Velvet in burgundy (this is available already made up into cushions for less than buying fabric plus insert would cost, though the inserts are not the finest quality). I'm using a mix of 20x20 and 18x18 cushions, plus a couple of 12x20 lumbar pillows. This number of cushions is just about perfect for letting me sit comfortably on the sofa with my back supported. It just might be a little bit of overkill on the number of cushions. But whatever. Those are Trend 02730 in sienna, and Fabricut Anytime Swirl in mustard. Note that those are Amazon affiliate links. We don't make a ton of money off Amazon. Actually, we have made a total of $2.64 from affiliate sales since I set the account up, so clearly I'm doing marketing all wrong. You can click those links and order, or you can click the links, see the item, and remove the affiliate link or whatever. We are clearly not in this to get rich (or if we are, we are terrible at it). The cats have been enjoying the cushions since they arrived. They came in vacuum-sealed flat packs, which helps for shipping, and over the next week or so Henry managed to open just about all those packs by clawing at them like a stupid jerk. The nice thing is that once opened, the cushions fluff themselves up pretty well to original size, and with a little bit of hand-fluffing, they are as full and fluffy as new. So if you don't have a jerk of a cat, you can store them for a while in a fairly compact space. The cushion inserts arrived fairly quickly. Fabric samples took longer, and now the final cuts of fabric will take quite a while to arrive. These sizes assume 50" wide fabric with a minimum 1-yard cut and increments of 1/2 yard. Many decorator fabrics require a minimum 2-yard cut, and may not allow partial yards, depending on where you get them from. Fabrics from fabric stores may allow 1/4 yard cuts, which is awesome and will save you money. I always add four inches to cover uneven cuts. If you plan to wash your cushion covers occasionally, you'll need to prewash the fabric and test to make sure it can stand up to that. I recommend getting a swatch first and testing that.